A number of outdoor centres, holiday villages and youth hostels in Alsace cooperate to offer holidays across Alsace. You can if you wish help rebuild a mediaeval castle using authentic methods, go canoeing, learn or brush up your French and German, or hike. 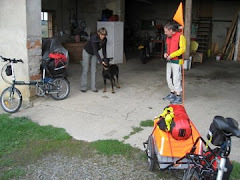 However the cycling trips would be of more interest to the readers of this blog: cycle touring in the North of Alsace or mountain biking along the Vosges Mountains. Much more information can be found under http://www.aja-tourisme.fr/en. If you looking for a holiday with children or young adults this could well be a solution.